The piece came to me through the estate of a very close friend, Bill Vann, who passed away in 2011. Bill was an incredible illustrator himself and had the most amazing personal collection of vintage illustration I ever had the pleasure of viewing. It is a privilege not only to possess such high calibre of work, but to have the honor to restore it to its former glory. 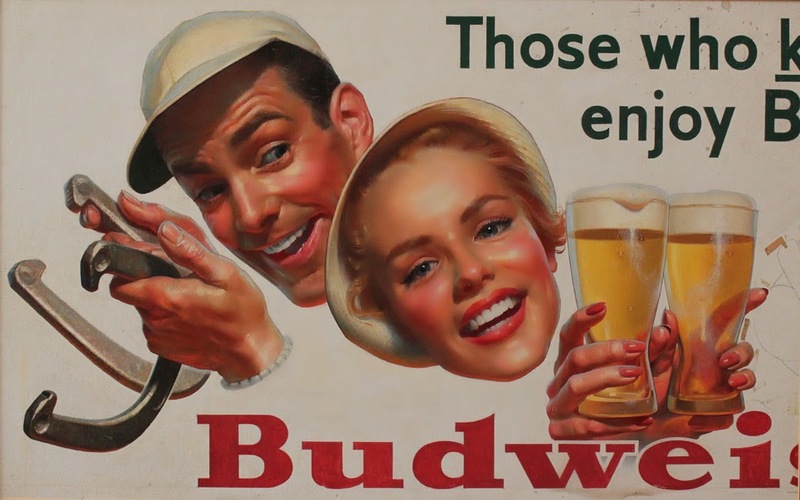 It is a Budweiser billboard from the 1950's, in what was coined (by MD) as his "floating head" period. Unfortunately, at that time, original illustrations were viewed solely as a means to a commercial end. Once a piece was finished, it might have been kept by an art director, shoved into a flat file, or discarded all together. In this case, one-third of the work (right side) was cut off. Likely, the party involved was only interested in the people, not the type or bottle. In any case, we are thankful at least to have part of the original work preserved. It features well over a dozen billboards by MD and confirmed the authentic layout/content therein. Now, it was a matter of putting in the necessary hours to complete the task at hand. Here is the illustration as it was received. Note the splatters (top right), masking tape, and though it may not be apparent in this photo, a generally dirty surface. The first order of business was tape removal and a good, careful cleaning. Per Ralph Mayer's Handbook of Artist's Materials and Techniques, a lightly dampened cloth/Q-tips (with water) was applied inch by inch over the surface surrounding, but not touching the heads. Thankfully, this simple but painstaking step did wonders in removing years of grime. Since the type is watercolor/gouache, however, extreme caution had to be observed when cleaning in and around the letters. Next, again citing the RM book, it was time to bring out the dental tools. These 60+ year old smiles needed a cleaning. Using a loop and a steady hand, I observed dirt within the pits of the brush strokes. Every effort was made to avoid contact with the metal edge and paint surface. The idea was to "pop" loose whatever soiled material was present, then gently clear it away with clean air. It was amazing to discover a rhythm, not unlike the act of painting itself, which seemed to take over during the process. Once again a tried-and-true method had worked its magic and the surface sparkled. Colors were vibrant and highlights turned their forms. The easy part was over. Now for the real work. A similar surface had to be located and prepared. The original board is masonite. It wasn't a problem finding some, as I too keep much of it on hand for painting. Though not perfect, it was a good match. After three layers of Winsor & Newton oil priming, it was ready for painting. Matching the color was a challenge, but with a little raw umber and ivory black added to the titanium white, a color with the proper "time stamp" appeared. The lettering was pretty straightforward too. I was able to use tracing paper to trace/transfer most of the letters, while the "s" and "r" (in Budweiser) were free-handed/cobbled together respectively. As was mentioned earlier, the type is watercolor/gouache, which was likely done by another artist. Often, the illustrator did the main image and technical artists would paint type and/or other mechanical objects. Thankfully, I'd just finished teaching a watercolor class last semester and was up to speed. Phthalo green (watercolor) paint was mixed with some raw umber and a very small amount of titanium white to touch up "Those who know enjoy Bud." There were many cracks in the letters which were laid back down with some subtle touches. Since the new lettering appeared on the new surface, I thought it would be more permanent to paint the remaining letters in oil. It worked well. The last stage was painting the bottle. This would be the most critical execution in order to give the proper "feel" of the piece, thus bringing it back to its original state. If this was not convincingly recreated, all would be lost. Thankfully I discovered early in my freelance career that I had a knack for painting bottles (Coca-Cola in one such case). The product must, of course, look cold and refreshing. High contrast and clean, sharp edges are needed to give the illusion of metal (bottle cap) and water droplets on a glass surface. I was once again indebted to internet research. Fortunately, a vintage Budweiser advertisement from the 1950's was located. It featured a hi-resolution photo of the specific beer bottle in question. I decided to paint it on Arches oil paper. By doing this, the original surface would not be disturbed with new paint. The main logo/lettering was carefully rendered, while the smallest type was merely suggested or "gooned" (as it was known in the business). The rest was just a matter of light logic on a transparent cylinder. Strong core shadows, hot highlights, and rich transmitted light all contributed to its solidity. Zots acid free/archival dots were then placed on the back of the Arches paper (generously) for good adhesion. Pressed into place, the illustration was complete. It measures 21" x 46". At this point, a connection was made. Such is my appreciation for these artists - Norman Rockwell, J.C. Leyendecker, Michael Dolas, and so many more, that to have the honor of sharing this restored piece with future generations gives a deep sense of fulfillment. Thank you and I hope you enjoyed this process.